The OHAUS Defender 5000 Series with its feature-rich line of indicators, bases and bench scales, is ideal for receiving, packing, production and shipping and general commercial and industrial weighing applications. The Defender 5000's applying features is a general purpose rugged stainless steel pans and painted steel frames as well as columns. 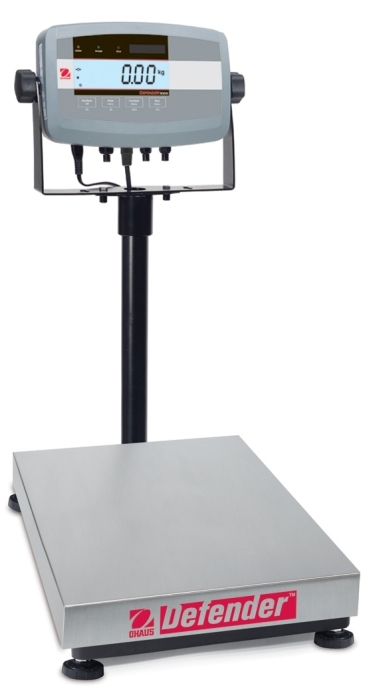 Its durable ABS plastic indicator is a powerful weighing machine. By enabling various modes of the Defender 5000 you receive the flexibility to customize its scale for a wider variety of specific applications at no additional cost or complexity. With rugged construction, yet comprehensive and intuitive multiple connectivity options, software operations, flexible mounting capabilities and optional NiMH battery operation, the Defender 5000 is your dependable one-product solution for an expandable range of weighing operations.